PSREC General Manager, Bob Marshall; SoCore Energy SVP Development, Eric Luesebrink; Sierra Army Depot Base Commander, LTC Benjamin Johnson; Sierra Army Depot Garrison Manager, Patrick Rothbauer; and PSREC North District Manager, Scott Welch break ground on the 2.5 MW solar project at the Sierra Army Depot in Herlong, California. 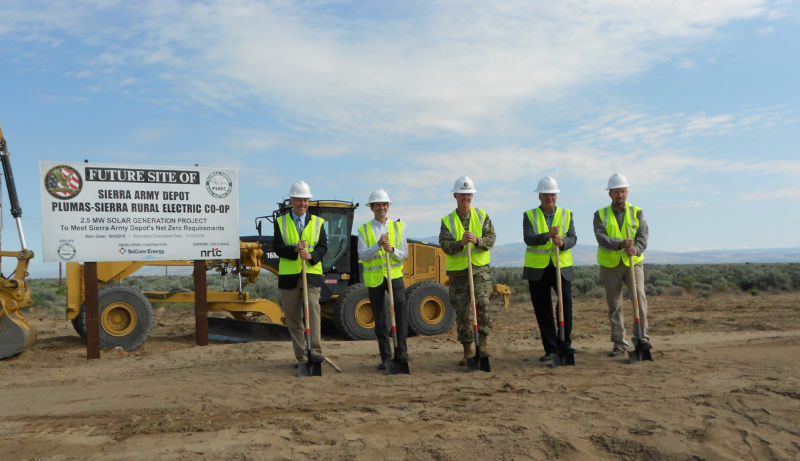 Plumas-Sierra Rural Electric Cooperative (PSREC) broke ground on a 2.5 Megawatt (MW) solar project for the Sierra Army Depot (SIAD) on May 24. The solar project is estimated to take five months to complete and is anticipated to wrap up late this fall. The 2.5 MW installation will help the Sierra Army Depot meet its net-zero requirements. In addition to meeting SIAD’s net-zero requirements, PSREC has contracted to include additional solar output to offer a community solar program to its members who may not want to make the large up-front investment in a solar system, are renting, or live in an area with shading where a solar system would not produce optimal energy output. If you would like to know more or would like to be added to our interest list to receive solar energy from the PSREC Community Solar Program, please contact PSREC at (800) 555-2207.